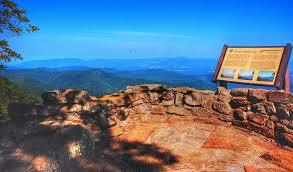 The NC Mountains offers visitors one memorable experience after another. We&#39;ve got easy walks and strenuous hikes, crystal clear mountain lakes and streams for swimming and boating, and mountain streams and rivers for fishing and cancoeing. The scenery is gorgeous, and you can see it everywhere from the seat of your car, to a bicycle seat or motorcycle seat, or the back of a horse. You can&#39;t go wrong looking out from any of these mileposts on the Blue Ridge Parkway during any season of the year. 217.5: Cumberland Knob. 1,000 acres, picnic area, comfort stations, drinking water. 15-minute loop trail to Cumberland Knob. (Elev. 2,855). Loop trail into Gully Creek Gorge. 2 hours. 218.6: Fox Hunters Paradise. Overlook and parking area. 10 minutes by trail to the Paradise, where old-time hunters listened to their hounds. Alt. 2,805. 229: US 21 Crossover. West 7 mi. to Sparta, NC., 17 miles to Independence, VA. East 4 Mi. to Roaring Gap, NC. 238.5: Doughton Park, 7,000 acres – Picnic area (Milepost 241), campground (Milepost 239), trailer sites, comfort stations, drinking water, 30 miles of trail. At Milepost 238.5 is the picturesque Brinegar Cabin. 248.1: NC 18 Crossover 2 Mi. west of Laurel Springs. 24 mi. east to North Wilkesboro, NC. 261: NC 16 Crossover. West 12 mi. to Jefferson, 14 mi. to West Jefferson, 26 mi to Grassy Creek. East 20 mi. to North Wilkesboro. 272: E.B. Jeffress Park. Picnic area, Comfort station, trail to Cascades. 276.4: Deep Gap. US 421 Crossover. W. 11 mi. to Boone. E 26 miles to North Wilkesboro. 291.9: US 221/321 Crossover. 7 mi. north to Boone, 2 mi. south to Blowing Rock. 292.7: Moses H. Cone Memorial Park, 3,600 acres. Many miles of horse and carriage trails, hiking, fishing. 294: Historic Flat Top Manor House; Parkway Craft Center; comfort station; visitor information, publications. 295: Julian Price Memorial Park. 4,344 acres. Campground, picnic area, lake, boating, fishing, trails. Alt. 3,400. Reservations for camping www.recreation.gov. 304.4: Linn Cove Viaduct Information Center. Visitor information, comfort station, publications. Trail access viaduct. Alt. 4,000. 305.2: Junction Parkway and US 221. 3 mi. west to Linville. 308.2: Flat Rock Parking Area. Self-guiding nature trail to superb view of Linville Valley and Grandfather Mountain. 312: NC 181 Crossover, 32 miles southeast to Morganton, 2 mi. north to Pineola. 316.3: Linville Falls. Visitor Center. Campground and picnic area. Trail to overlooks of falls and gorge. For more information on Linville Falls, click here. For camping reservations www.recreation.gov. 316.4: Linville River Parking Area. One of the Parkway&rsquo;s largest stone arch bridges. Three spans of 80 feet each. Fish in Linville River. Picnic area. Comfort Station. Alt. 3,250. Take Spur Rd. to Linville Falls, campground and visitor center. 317.4: South 1 mi. to Linville Falls community. 24 mi. To Marion. 320.7: Chestoa View offers an unusually fine view from one of the many vertical cliffs on Humpback Mountain. 331: NC 226 Crossover. 6 mi. north to Spruce Pine. 14 mi. south to Marion. While traveling on the Blue Ridge Parkway, Ashe County is defiantly one of the counties you will want to visit.&nbsp; As people discover this once forgotten community, many are compelled to purchase NC Mountain Real Estate here. The stunning views, interesting lifestyle, and business opportunities make West Jefferson NC Real Estate some of the most sought after in the High Country region. Plus, when you purchase Ashe County NC Properties, you&rsquo;ll not only be able to enjoy spectacular views of the Blue Ridge Mountains and participate in all of your favorite outdoor activities, but you&rsquo;ll be near all of the best towns in the High Country and all of their fabulous amenities. Boone, NC and Blowing Rock, NC are just some of the charming communities to which folks who purchase Ashe County Real Estate have easy access too. Check out our listings or do a MLS search for any High Country Real Estate from our website (www.a1mountainrealty.com). The possibilities are endless, so consider purchasing NC Mountain Real Estate with A1 Mountain Realty in Ashe County NC today and see how this thriving community can benefit your life. ← Campgrounds on the Blue Ridge Parkway!